Proactive Mobile Forensics: Where is Your Data? With over 5 Billion mobile devices presently in use, mobile applications enable new threats and attacks which introduce significant risk. The biggest risks are data loss through an exploit or from devices being lost or stolen. Are your mobile applications susceptible to common software vulnerabilities? Do you know what critical data is being stored on these devices and backed up in the cloud? Is your sensitive data protected if a device is lost or stolen? Join David as he explains how to be proactive by examining your mobile applications, provisioned devices and their footprints. As Aspect Security’s Global Practice Manager of Mobile Application Security Services, Dave has first-hand expertise in helping clients in the financial and retail sectors with their mobile security programs. David is an OWASP Mobile Top 10 Project Contributor. 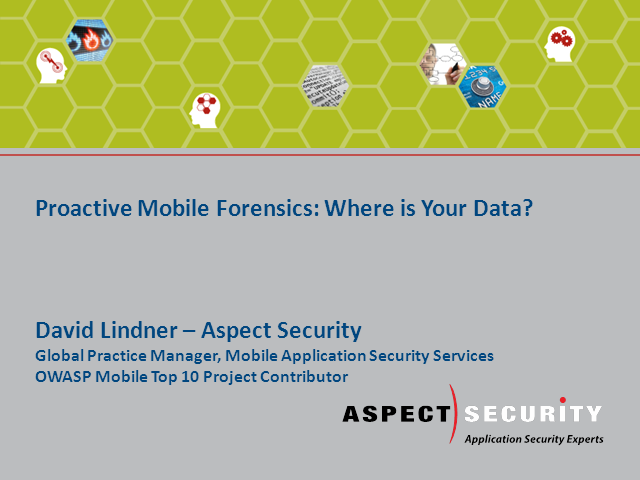 David Lindner, Global Practice Manager – Mobile Application Security Services, Aspect Security, Inc. Title: Proactive Mobile Forensics: Where is Your Data? Presented by: David Lindner, Global Practice Manager – Mobile Application Security Services, Aspect Security, Inc.